IVEK offers a wide variety of small volume dispense orifices and nozzles to compliment our precision fluid metering and dispensing systems. Typically used in conjunction with our small volume dispensing systems and micro pumps, these nozzles augment the delivery of extremely precise fluid volumes. Our nozzles include ceramic, peek, sapphire and stainless steel orifices, whose natural properties of extreme hardness, chemical inertness and wear resistance make them ideal choices when extremely precise liquid flow control is needed. 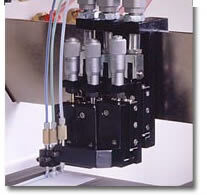 They serve as a valuable addition to IVEK’s line of precision small volume dispensing and metering systems. IVEK custom designs and/or specifies commercially available nozzles to meet application requirements as required. Accurate and repeatable orifice diameters ranging from 0.003" – 0.020"